Dear artists, colleagues, friends and art-enthusiasts, We proudly invite you to the opening of our exhibition “The Social Art Award – Invigorating the Rise of Social Art”, presenting the final winners of the first edition of the Social Art Award and launching the accompanying book. The Social Art Award Ceremony will be held on September 5, 2017 at 7 pm at WHITECONCEPTS Gallery, Auguststrasse 35, 10119 Berlin. The exhibition will run through September 10, 2017. We look forward to cherish and discuss with you the stimulating artist contributions and our newly claimed field of Social Art. Meet the winning artists Lino Tonelotto, Quek Jia Qui and Diogo da Cruz, the organizers and the jury members, to share your thoughts and opinions. Our goal is to build a vivid dialogue regarding the importance that artists can play in creating a change in the world. We define Social Art as any artistic expression that aims at creating a social impact and make a difference. This definition delineates the intention of the artist as crucial; Art engages in questioning and rethinking existing systems and paradigms. Artists are visionaries, utopists, agents for change, with the ability to affect society by creating emotionally captivating experiences. It is aesthetic revolution that preludes societal revolution. 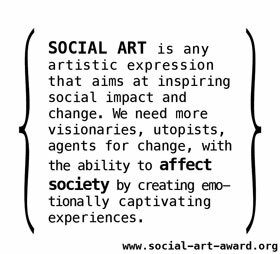 Thus, the goal of the Social Art Award is to invigorate the rise of Social Art. We need more people to create impact and to inspire change. Even if this approach dissents from the widely claimed autonomy of art. The award explores this field, and seeks to raise attention for Social Art. Furthermore, the award focus on strengthening the recognition of social artists, valuing their work and eventually highlighting the importance of Social Art for society. The first edition of the Social Art Award was launched at the beginning of 2017. It caught the interest of artists from 131 countries with diverse backgrounds regarding culture, age and gender. Their impressive entries addressed very different issues. 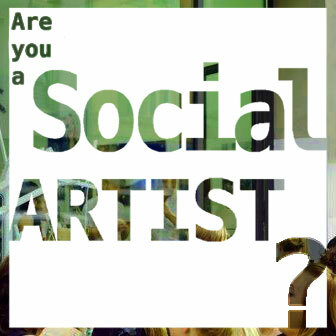 The Social Art Award is an independent and not for profit initiative by the Institute for Art and Innovation e.V.